Last week, I conducted a browser experiment with students at the Royal College of Art. The idea was to continue some of the investigations I've been doing on conceptions of different types of spaces--except this time, instead of looking at how people think of physical space, I wanted to examine how they think about non-space (aka their browser histories). After all, part of my mission for my fellowship project this year is not just determining how to map browser histories, but also figuring out how people think of them. Hopefully, doing the latter will help reveal what type of meaning, if any, these histories can contain. 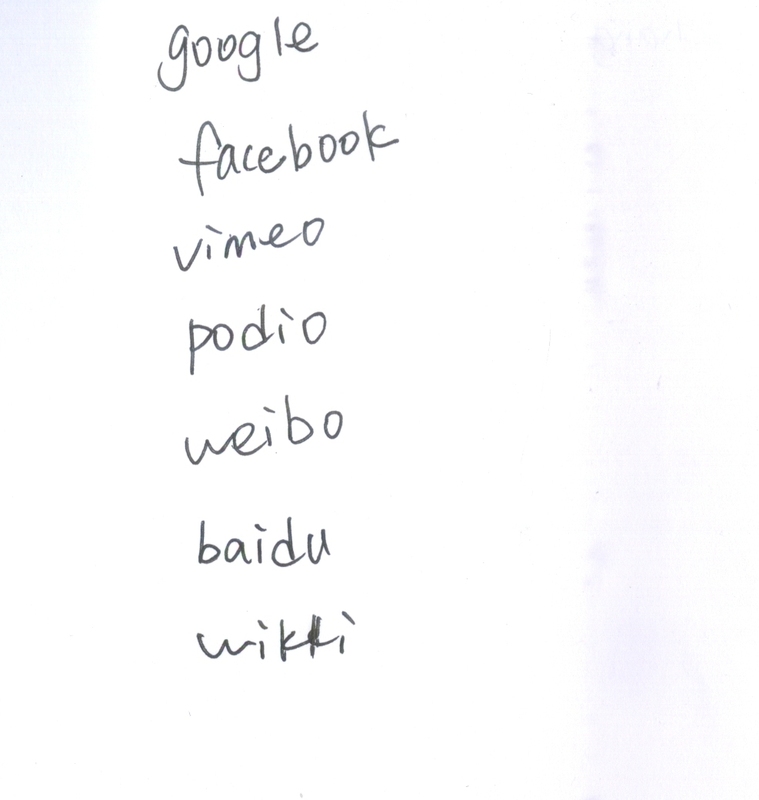 For the experiment, I asked a group of about ten students to write down every single site that they remembered visiting on their computers over the past 24 hours. Then they gave me their actual browser histories so that I could do some comparisons. They had been pre-warned that they would be asked to do this, and they and their data are respectively anonymous and secure. I've only just now begun diving into the data, but I thought I'd show some of the immediately apparent results. As you can see, they don't have very much written on them. 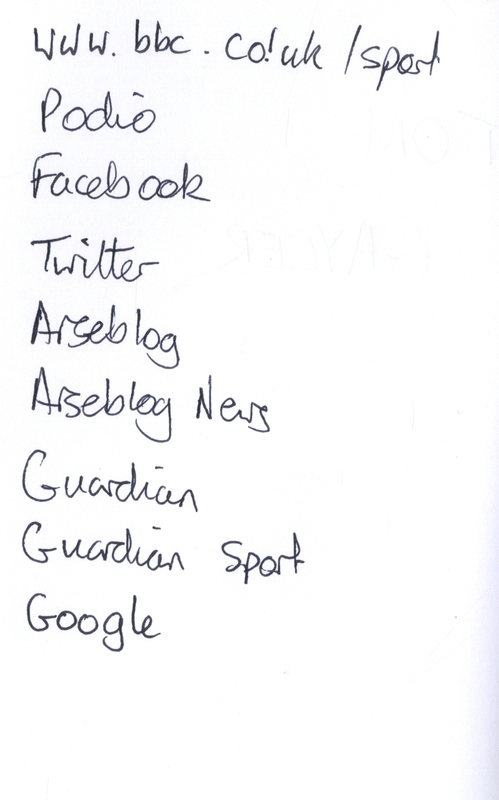 The most that any one person remembered was 14 sites; the least, 3. They also all have some clear overlaps in sites. 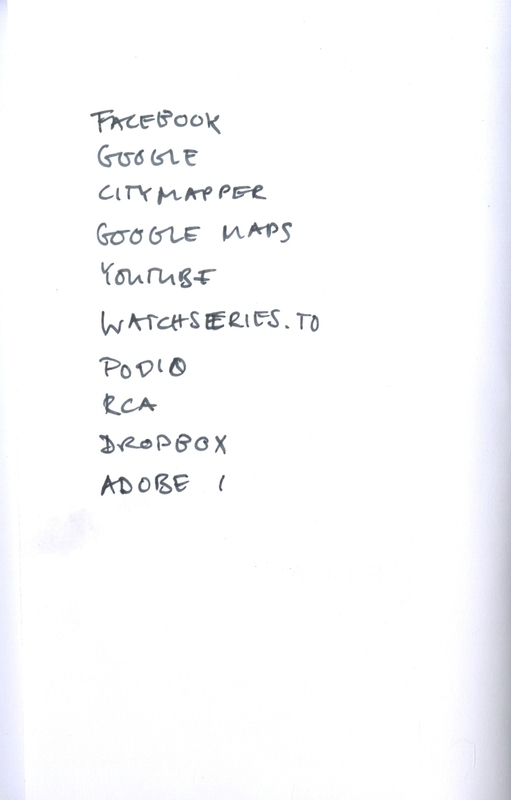 Though I've only shown a few samples, nearly every single one of them had Google, Facebook and Podio (a platform for comunication that we use at the RCA) on their lists. Revealing, but not necessarily a surprise. Browser histories are essentially saved as SQLite database files (though it really depends on the browsers), so I did a bit of exporting and wrote a few Python scripts to begun looking at the data. It's worth mentioning the fact that though all of the students individually remembered no more than 14 of their sites, the actual number of sites they visited in the time frame were much more than that, ranging from anywhere from 80 to 353 sites. So far I've seen that the students on average remembered no more than about 10% of the sites they visit. Again, this doesn't come as a complete surprise, but it is interesting to see the actual numbers. Memory and cognition are very much tied together; and as much as I hate to cite TED talks as research, journalist Joshua Foer does have a great talk about strength of spatial memory and the fact that humans remember things in context. The browser history remains a space out of context, and thus the way we think of it is fundamentally different. The fact that the students were so completely removed from the sites that they visit everyday corroborates this. I should mention that this is still a theory. After all, I haven't nearly dived into the subject or data enough. For instance, browser history databases include data on how long you spend on sites; though I have looked at the data myself and anecdotally have ideas about the ties between those numbers and the sites that the students remembered, I do need to get the actual figures. So in conclusion: these are just the barest, most preliminary results, but they do show that there's a divide between what we go online and where we actively remember going. I'll eventually be doing some more work with them before I delete the data for good. 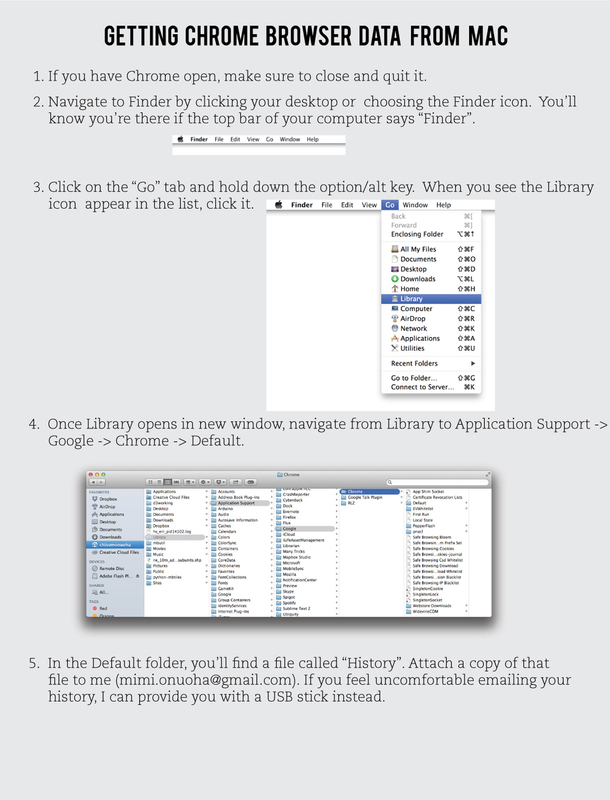 Below I've got some of the guides that I gave out so the students would know how to access their histories. 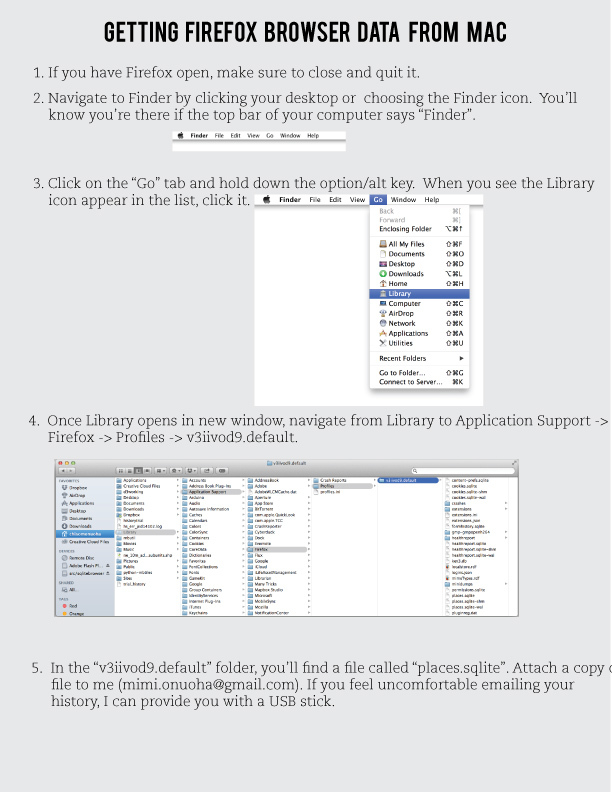 Feel free to take a look; I think it's good practice to know where the information is stored. Right now I've only got the ones for Mac + Chrome and Safari, but the Windows versions are on the way.